The Indialantic by the Sea hotel has a hundred-year-old history on beautiful Melbourne Beach, Florida, and more than a few guests seem to have been there from the start. When Liz Holt returns home an an intense decade in New York, she's happy to be surrounded by the eccentric clientele and loving relatives that populate her family-run inn, and doubly pleased to see the business is staying afloat thanks to its vibrant shopping emporium and a few very wealthy patrons. Liz Holt is a successful author who returned to her childhood home in Florida because of a scandal in New York, one that left her face scarred and her person ostracized from literary circles. 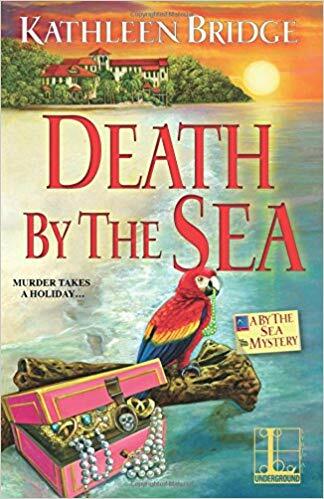 But all is not well at the Indialantic Hotel by the Sea; first she is introduced to Ryan Stone - a New York firefighter who apparently detests her at first glance and is there to help his grandfather with his delicatessen inside the Indialantic Emporium. While this book was an okay read, there were things that bothered me. Let's be honest, shall we? Liz states she was ostracized by the literary community for something that occurred between her and her ex-boyfriend, also a writer, that left her with a permanent scar on her face. We have no idea what this is, since the author didn't see fit to tell us. Oh, please. If the literary community didn't ostracize many other authors for scandals (including murder) then what did she do to have this happen? There have been plenty of literary scandals dating back decades ago; plus she was acquitted of any wrongdoing - and it's unfair to the reader not to give the details so we can judge for ourselves if we think it was ostracize-worthy. Which brings us to Ryan, who has nothing but disdain for Liz for the "supposed scandal" he knows nothing about (welcome to the club, Ryan!) He rushes to take the side of the man involved without actually having been at the trial or knowing the details but merely accepts it because of the other person being a man whose book he read (then tries to get out of it later by using the bro-code, which just doesn't fly). He just assumes she's guilty and starts calling her Princess (which is what her ex called her) to make digs at her; this tells me he's a louse at heart. He doesn't even want to know the truth or he would have taken the time to learn it. A good man wouldn't have made assumptions and we're supposed to believe he 'reforms' after spending time with her? Then we have an eighty-year-old woman (Great Aunt Amelia) who practically gambols around a hotel merrily (not to mention allowing a guest to verbally attack her niece without saying a word in defense). Amelia comes off as practically having dementia. She's living in the past of her youth, watching old television shows she was on, talking about them constantly. She just can't move on to the present. I seriously doubt if retired actors sit around and talk about their old films/TV shows or even watch them. I doubt if they spew the content to anyone who will listen. And hasn't everyone who knows Amelia already heard every single story? She seems to have been a prolific actress but not a very good one if she couldn't land a permanent role. She needs to get a grip. I think she's supposed to be eccentric, but just comes off as pathetic. I didn't find her interesting, merely the type of person who sits and rambles about their past. Sad, actually. There's also an eighty-year-old chef who falls asleep, forgets ingredients (that Liz has to add) and makes a mess of the kitchen (that Liz has to clean up). Who did it while she was living in Manhattan? Who made sure the meals were correct? Or did people just eat the food without realizing key ingredients weren't there? Why are all the shops named "by the Sea?" Can the tourist not figure out these places are by the sea and need to be informed before they enter every one? Overkill. Wordy. Not necessary. There was also too much talk of 1960's television and it felt as if it were just filler. Yes, there are people who have never seen these shows and/or don't know the characters; but then again we don't really need to know the plot of every single show Amelia was on. It also seems like everyone is living at the hotel for free except for the Worths, so how are they making any money to keep it going? Everyone (except Liz and Ryan) has a 'suite of rooms' at the hotel. I didn't really understand why Liz was investigating; she didn't have a reason to do so, it seems Charlotte was doing a decent job. But is it Detective or Agent Pearson? At first she's introduced as Agent Pearson, then later on it's noted she's a homicide detective. Do they call her Agent Detective Pearson (or Detective Agent Pearson)? One or the other, please, but not both. The murder was solved nicely although I think the pieces fit together a little too conveniently. It seemed as if the author just couldn't bear to hurt anyone in the book regardless of their level of guilt. I also didn't much care for Ryan, Liz, or Amelia, and you need to care about the characters. Hopefully this series will improve with the second book, and also hopefully we'll find out what exactly happened to Liz that sent her scurrying home to Papa and Aunt Amelia; but if I have to listen to many more of Auntie's stories, I don't know if I'll continue on to book three. Daria's roommate, Aileen, plays guitar in a metal band, but one of her bandmates is branching out musically and asks Daria to craft a kilt for an upcoming bagpipe competition. The locals in Laurel Springs, Pennsylvania, are really looking forward to the Highland Games, and the Scottish regalia needs to be just right. 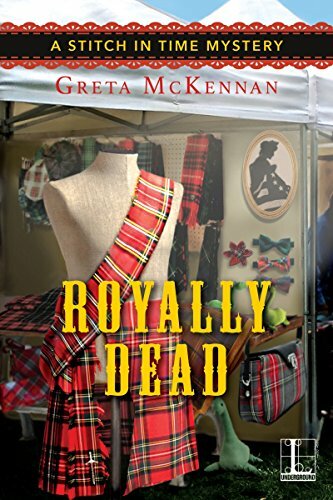 Daria Dembrowski is a seamstress who is attending the Highland Games both as a vendor and a spectator when she finds out that her renter Aileen, singer and guitarist for the band Twisted Armpits, seems to know one of the game contestants, Ladd Foster. Their meeting doesn't seem to be a pleasant one, but Daria decides to stay out of the altercation. The festivities are in high gear and she plans to be part of it, and that includes meeting the author Morris West, who has written a fictional book about Scotland's Bonnie Prince Charlie and when he meets Daria, envisions her as his heroine from his book named Catherine and continues to call her by that name, to her annoyance. Then Aileen's bandmate Corgi asks Daria if she will fashion a kilt for him, since he's learned to play the bagpipes and wants to enter the competitions - the one he has is a cheap knockoff and will not pass muster and even costs him points in performing. But during the games Ladd suddenly collapses and falls dead and Daria, with her innate curiosity discovers the source which happens to be the flask he was drinking from during the day. While it seems he left the flask in a tent that was also visited by four others beside herself - including Aileen - she wonders which one hated him enough to kill him. But when the police arrive, the flask has disappeared from the tent, and now finding a killer as well as the weapon of choice could be very difficult indeed. This is the third book in the series, and after reading the first two, I truly believe that Ms. McKennan has found her voice. While I have to be honest and say I wasn't enthralled with the first one, in this book the story line kept me riveted throughout. While it may seem to some that there are several plot lines going at the same time, they are all (mostly) entwined and watching them come together is indeed a delight. We follow Daria as she innocently tries to complete the wedding dress and create an authentic Scottish kilt while not only participating in the Scottish celebration but watching it as well, while surreptitiously keeping an eye on the young Gillian in an effort to keep her out of harm's way. Adding to this is the fact that Daria's tenant Aileen is suspected of killing Ladd, although Daria knows it's not possible. Aileen may act tough, but Daria knows there's a soft underbelly that wouldn't kill. So she sets out to look at the other suspects while trying to find out who had the best motive; even involving her maybe-boyfriend Sean McCarty, a newspaper photographer/reporter. (To be fair, he plays along with her willingly in the hopes he'll get a story). All in all, as I stated above, the plot line was very good and the story was written well. 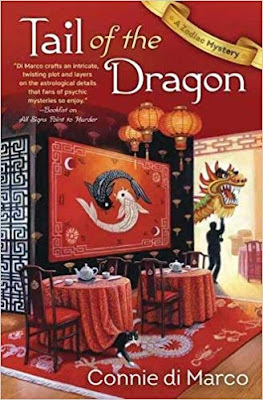 I enjoyed the twists and turns throughout the tale that brought everything together in the end, much like watching a fine tapestry being woven and delighting in the final product. When the killer was discovered (although I figured it out early on - but then again, I read a lot of these) and the reason for the murder revealed, it reminds us that even those that seem the most stable can often be the most insane around us. Ms. McKennan is indeed learning her craft, and this, as the third book in the series, proves that fact. She has managed to give Daria and Sean life, and make us want to visit the small town of Laurel Springs, Pennsylvania. Her characters are becoming well-rounded and believable; and when I finished this book I realized I was ready for the next in the series and that's a very good thing. Recommended. When the reality show My House in History comes to Laurel Springs, Pennsylvania, savvy seamstress Daria Dembrowski sees a business opportunity. The show follows two elderly sisters' quest to restore their colonial mansion and that means a heap of work for a seamstress who specializes in historical textiles. Although one of the old women is a bit of a grump, Daria loves the job-until she discovers one of the researchers dead, and the whole project threatens to unwind. 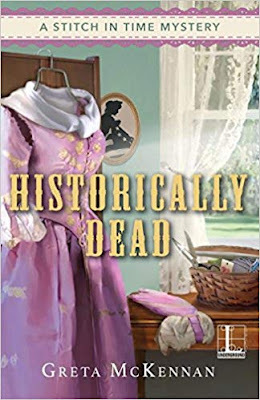 When Daria Dembrowski accepts the task of sewing historical clothing and curtains for a couple of elderly women in her town, she's willing to put up with the bad attitude of one of them. She's willing to work in the home instead of her own. She's not so willing to discover a dead body - but that's exactly what she does. Her job is part of a reality television show where people agree to have their homes returned to their original historic beginnings - which in this case means ripping everything out of the kitchen and having a brick hearth installed (but incredulously, they're not ripping out the bathroom plumbing. Go figure.) Anyway, Daria is installed in one of the bedrooms converted to a sewing room where she can live in part time while she sews historical clothing and curtains - by hand - for the residents of the home while everything is being filmed. There is also a local college professor in residence who is helping, and he has the drawings Daria needs to complete her work. When she attempts to locate him she does exactly that - but not in a living condition. Soon it's discovered that he's been murdered, and the entire household is under suspicion for his death. Surprisingly, knowing she's under the roof with a murderer doesn't faze her as much as it should, even while she's trying to figure out who killed him. But as if things couldn't get any worse, she's also in the process of creating a wedding gown for a nice young law student named Fiona, and discovers that Fiona's fiancé is none other than her own ex, the lying, stealing Randall Flint. Since she likes Fiona she won't say anything, but what makes it doubly uncomfortable is he's also the attorney for the two sisters and is spending nearly as much time at their home as she is. I almost didn't read this book because I was so disappointed in the first, but I have to admit that this one was better, which is a good thing. However, it isn't to say that it doesn't have its problems. First, she's been dating Sean McCarty, the photographer for the local newspaper, and she doesn't treat him very well. In fact, they don't really act like a couple. There's a bit of hand-holding, but that's about it. No cuddling, no kisses; it seems she's more interested in him as a ride to the fabric store than anything else. It's sad because regardless of the fact I don't care for men with long hair, I'm beginning to like him as a person (and feel sorry for him, which is worse). Which pretty much explains why she didn't demand Randall give back the money he stole or pointing out to Fiona that he's a slimeball. She's still a doormat in this book, which is rather disappointing. I had hoped she'd gotten a backbone, but no such luck. She's proving that she has no common sense when it comes to men at all. She lets Randall walk all over her, but keeps McCarthy at arms length. However, the writing was much better this time out, and the mystery was decent. 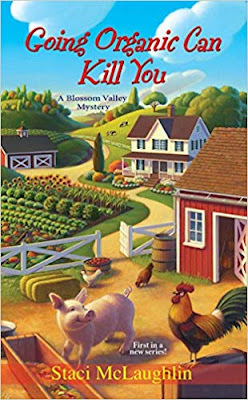 While I figured out who the murderer was pretty early on (I read a lot of these), there were still enough twists and turns to keep me interested for the most part. There were a couple of interesting scenes thrown in, and I do like it when people get their comeuppance. I still think there's something wrong with Aileen - as I've stated before, rockers don't dress at home the same way they dress when they're onstage (as I've stated in a previous review, can you imagine members of Kiss or Alice Cooper walking around dressed like that in daily life?) Yeah, they don't. So there's probably something a little mentally off about Aileen - which you can figure out yourself if you read what she eats, which is enough to make anyone throw up. While she might seem fierce, it's hard to truly like someone like that or make them a believable character. Everything came together in the end and the pieces fit together nicely. Daria proved that she can be brave when she wants to be (and I know I'm repeating myself) so it doesn't make sense that she's not brave enough to face her fear about driving. If you can face down a murderer, you should be able to face down the mean streets of a small town. 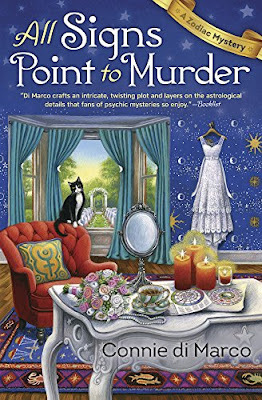 A cozy mystery for a quiet evening's read. Daria has come up with a brilliant new plan to expand her seamstress business beyond stitching wedding gowns - historical sewing. And with Civil War re-enactors setting up camp in her hometown of Laurel Springs, Pennsylvania, she has plenty of opportunities, including one client playing a Confederate colonel who's a particular stickler for authenticity. But soon the small-town peace starts coming apart at the seams as an antique doll is stolen from a Civil War exhibit and the cranky colonel is found impaled by his own bayonet. When Daria's brother is suspected of the theft and a bridal client's fiance is accused of the murder, Daria is determined to untangle the clues to prove their innocence. She needs to get this case sewn up fast, though, before the murderer re-enacts the crime and makes her history. Daria Dembrowski is a seamstress who works out of her home. She's currently making wedding gowns and such but wants to branch out into historical costumes. 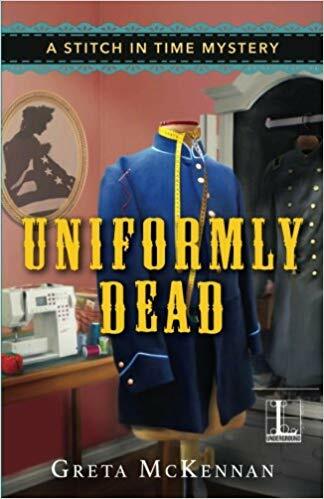 She's given her chance when a man named Colonel Windstrom (his re-enactor name) hires her to make his Confederate uniform 'historically accurate.' But then her brother Pete arrives asking to stay with her, and she learns why soon enough, and it's not a pretty picture. When she gets Pete to take her to a local museum so she can study uniforms for accuracy, there's a bit of a debacle. First, Pete's long time nemesis Emmett McDowell is there, signing copies of his new book and still harassing her brother no end. Pete finally has had enough and leaves, but as he's doing so, there's a commotion between the colonel and a man who seems to be a photographer which has him accidentally running into Daria and knocking her to the floor. After she's helped up by another re-enactor, Jim Laker, the lights go out and when they come on again, a doll in the exhibit is missing and the finger is pointed at her brother. Meanwhile, she still has the wedding gown she needs to finish for a friend named Marsha, and she's getting married within the week to a nice young man, Chris, who also happens to be one of the re-enactors. When she arrives at the battlefield for a final fitting for the colonel, she's not surprised he's just as unpleasant as he's always been and discovers when the transaction is over that she's been stiffed twenty dollars. Not wanting to face the colonel again she decides to let it go, but realizes she's left her tape measure behind and when she returns to the tent to retrieve it finds her friend Chris standing over the bloody body of the colonel holding the bayonet that killed him. This is the first in the series and therefore I usually give the author a bit of leeway as to storyline, characters, etc. But when you begin a book with something that obviously doesn't make sense then it doesn't bode well for the rest of the book. As I've stated many times, I'm a person who pays attention to details, which is why I couldn't like this book. Supposedly her ex-boyfriend lived with her while he was going to law school, then when he passed the bar he worked in his father's firm for awhile but eventually skipped town, taking everything in their joint bank account with him. First, he's an attorney and knows this is against the law. Secondly, he worked in his father's firm - which, I'm guessing is in town since she didn't state otherwise. So why didn't she go see the father and ask his help in getting her money back? Unless he was on his son's side and encouraged him to steal from her, he should have been some help since he probably knew where his son was. If he was on his son's side, his law practice would have been down the tubes the minute everyone she knew found out what had been done, and that the father hadn't stopped it or helped her get the money back. This would show that he didn't care about theft in his own family; and I certainly would have made it known that he refused to help. This is mistake number one. How could her brother be accused of stealing the doll when he left the museum before the lights went out? Did he run back in very fast and turn out the lights, smash the case, steal the doll and then run out again in a matter of minutes? Please explain this. Daria says she hates driving, and takes the bus everywhere. So she carries items she makes on a crowded bus without worrying about them being wrinkled or jostled? You can't just stuff handmade clothing into a bag as she does. It needs to be in a garment bag, and where on earth on a bus are you going to keep it nice? She’s a seamstress, and what if there was an occasion where she’d have to go to a customer’s home or the bus was late? It doesn't seem like this is a very good career choice for someone who won't drive. Which brings us to the fact that Daria is a doormat. She hasn't got the backbone she was born with. She allows everyone to push her around instead of standing up to them, and I hate women who are weak-willed. I also don't care for male love interests with long hair, so Sean never appealed to me at all. Unfortunately, with these things being unappealing, you can pretty much guess that the book would be unappealing, too. Then, Officer Carson keeps investigating. Why? Is this town so small there are no homicide detectives? In that case, one would be imported from the nearest town over. Officers do not investigate murders. Homicide Detectives investigate murders - and they don't wear uniforms, something the author should have known if she's seen even one crime show on television. Another example is the waltz they were playing at the Civil War ball was The Blue Danube, which wasn't composed until 1866 or performed until 1867 - after the Civil War ended. They wanted to be accurate, so should have chosen accurate music. Also, what about the situation with Daria and Pete's father? We're given a paragraph about it, but nothing else. Is this the author's way of ensuring we read the next in the series? This is just the author 'holding the readers hostage' in order that they will read the next in the series. It was difficult to get past these things, because most of them could have been handled differently and more believable. As it was, the entire book seemed like the author didn't care, she just wanted to get something published. I couldn't even get excited about the ending, which was pretty decent, because of it. I don't know if I'll be reading another in this series or not. The house sat empty for fifteen years, taking up prime real estate along the picturesque coastline. Built by one of the founders of South Cove, its last known owner, Maryanne Demerit, vanished without a trace. Now her home will be demolished for a condo development, but until then, it's the perfect spot for a Halloween haunted house. It's nearing Halloween, and Jill Gardner, owner of Coffee, Books, and More in the small town of South Cove, California, has agreed to spend a weekend in a soon-to-be torn down haunted house, along with her boyfriend Greg King, South Cove's sheriff, and three other couples. Among them is Greg's receptionist and local psychic Esmeralda, who insists that the house really is haunted. When they find a room full of potions they decide to do an impromptu seance that leads them to discover that the the resident ghost is a woman named Maryanne, who was also a witch, but others are not so sure. They also have a partial idea of why she's there - to find her child - Jill's ever-active curiosity takes off, especially after a disturbing dream about Maryanne during which Greg was having trouble waking her. 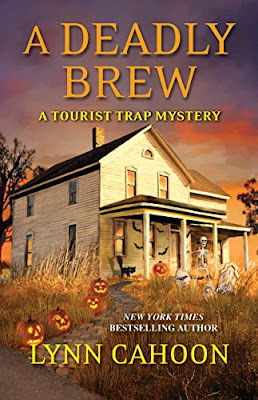 This is a short story written by the prolific and talented Lynn Cahoon, part of the Tourist Trap Mysteries. Because of some of the things written (a scene involving Sasha, for one) I get the idea that this was written earlier but never published in the order it should have been. However, as far as short stories go it was not only quick, as it was meant to be, but delightfully semi-spooky as well. I rarely read short stories because I don't feel they give enough background nor information before they've ended, but Ms. Cahoon has managed to incorporate our characters well - and if you read it you know them well; if not, I suggest you start with the beginning Guidebook to Murder, because the series will reel you in and you'll want to read the others. The writing is brisk, the mystery well done, the plot line intriguing. Another sparkling tale in the series, which is always welcome. Anyway, it's a delightful tale that doesn't have a scary quality, but still has a couple of nice scenes, and discovering the truth of what happened to Maryanne is not only interesting, it shows us how easily the author can pull us into the story and keep us there to the end. I truly enjoyed this one, and if I had any questions, the only one would be, why didn't Maryanne just stay in Louisiana? Highly recommended. A devoted dad is as precious as diamonds, but Carrie Singleton wouldn't know since her dad Jim's been on the lam most of her life. In an unusual family reunion, she finds Jim breaking into her cottage in the middle of the night. The fun really starts when he begs her to help him recover his half of a twenty-million-dollar gem heist he pulled off with the local jeweler, Benton Parr. When she refuses, Jim takes off again. Retreating to the confines of the library where she works, Carrie watches as Smokey Joe, the resident cat, paws at a hole in the wall. Is he after the library's ghost Evelyn, or something shinier? Carrie Singleton is settling nicely into her childhood home of Clover Ridge, Connecticut; she has a job she loves, a great place to live, a new boyfriend, and a new pet. But suddenly her life is disrupted one night when she hears someone breaking into her home - who turns out to be her long-gone father, Jim Singleton. Jim is a thief who's come back to get the jewels he lifted in a long-ago heist, but his ex-partner isn't giving them up. He's asked Carrie for her help, but she refuses. What makes it worse is she discovers the partner is a member of the library board, Benton Parr; and when Benton is murdered soon after and her father is a suspect, she decides to do a little sleuthing on her own to find the gems, wanting to give them to Dylan Avery, an insurance investigator who's been working on the case. Having recently read the first in this series, I was hoping that the author would have honed it a little bit more. But I felt that Carrie still seemed immature in this one, repeatedly breaking up with Dylan because he "used her" to get to her dad, without actually talking to him about it. So she has no idea whether he used her or not, does she? She also mentions that one character has PTSD, but I don't think she understands what it is. You can't get PTSD because your husband accuses you of having an affair (which she was) or that he wants you to find a better paying job. A bit of research could have cleared this up. There were also some things that seemed rather unbelievable. The library is supposed to be in an old Victorian home, yet has a utility room, a break room, an events room, and even a coffee shop! In what library would there be a coffee shop? They don't want you eating or drinking around the books, not to mention the smells that would permeate the library from the food. Then Sally told Carrie that she had to conduct the holiday chorus because the maestro took ill! Really? Singing in a chorus does not give you the skills to lead one. (I'm still amazed that this library has so many programs and events that other, larger library systems across the country have never done, but hey...) Anyway, because of all the things I've mentioned above, where do they keep the books? It seems all of the space is taken up for other things. I also think there weren't enough descriptions of people - aside from the fact of Carrie's hair color, I honestly don't know what she looks like (although she does wear makeup, and that's a plus because I hate books where the MC 'throws on a little lip gloss' and everyone tells her how beautiful she is); and there are no descriptions of the town at all, so one can get an idea of what it looks like. More detail should have been paid to this. I was also surprised that her father Jim, a known criminal, just waltzes into town after not being around while Carrie is growing up and expects her to help him retrieve stolen gems. What kind of father would do that? Why would she allow him to stay with her after that? I'd kick his sorry behind to the street without a how-do-you-do after that opening. Yet she does let him stay, and again unfortunately, it made the first part of the book so boring I almost gave up. The conversations between any of the characters had no zip, no spark. None of the people seemed to have any life in them; certainly not enough that if it hadn't picked up in the last half I may not have finished it. 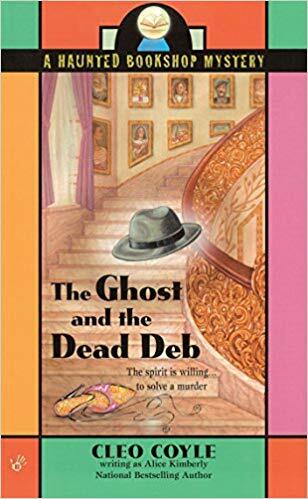 I also don't understand why this is called Haunted Library Mysteries. The library may be haunted with the ghost of Evelyn, but she adds nothing to the book. She's only in it for about 10%, and when she did ask Carrie to do a favor for her - speak to Morgan - the entire episode seemed like filler and nothing more. It could have been left out entirely and wouldn't have changed the book one whit. She doesn't help solve the murders, she doesn't give any helpful information - she thinks listening to others' conversations is eavesdropping - so she doesn't even add to the story. Sorry, but there it is. The part that irritated me the most though is the fact that Carrie is under the impression that Smoky Joe is a dog. That's right, a dog. You don't put out food for a cat several times a day; unlike dogs, they don't eat everything in the bowl until they writhe in pain. When they're finished, they walk away, so you can leave the kibble in the bowl all day. You also need a carrier for a cat. They don't lie down on the seat; they're curious and will walk all over the car - and you certainly don't consider leaving them alone in a car while you go about and run errands! Plus, if you're going to take the cat to work with you every day, invest in a leash so the cat can't just escape your arms (which they can do very easily since they have very sharp little claws, you know; as I mentioned, they aren't dogs). I wasn't really surprised as to the identity of the killer, as there wasn't a big suspect pool in the first place, but this wouldn't have made a difference if the things I mentioned above had been otherwise. In the end, the book wasn't bad but it still needs work; we need to know what the town looks like, what the people look like, and better treatment of Smoky Joe. 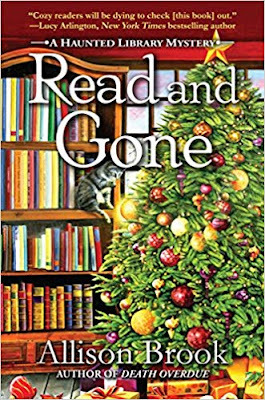 Carrie Singleton has returned home to Clover Ridge, Connecticut to live with her aunt and uncle while she's working as a temp in the local library. When she's unexpectedly offered the position of Programs and Event Coordinator, she's about to turn down the position until she hears a voice tell her to think about it overnight. Meanwhile, Carrie realizes she needs to put down roots somewhere, and regardless of her past - through no fault of her own but that of her parents - decides that she's much happier around her Uncle Bosco and Aunt Harriet, so endeavors to try and make the job work, but, as her aunt points out, if it doesn't she can always quit. Her first program guest is one that has been recruited by her predecessor Barbara - Al Buckley, an ex-homicide detective who's been haunted by a case he didn't solve while on the force. He's speaking to announce that he finally - after fifteen years - knows who killed Laura Foster. But when the evening arrives that he's going to give his speech, it's apparent that there are people who don't want to know the truth. Laura's son Ryan arrives and starts threatening Al, and brings along the family attorney just in case. While speaking, Al seems to have trouble breathing and quickly drops dead. When it's discovered that he was poisoned while at the library during his speech Carrie realizes that she needs to solve this murder in order to put things right for the library. She has help from an unlikely source - Laura's younger son Jared, who also wants to find out his mother's murderer. She also has an enemy at the library - Dorothy Hawkins, a reference librarian who believes the job would have come to her if Carrie's uncle (a library board member) hadn't insisted the director hire Carrie instead. Carrie's positive that Dorothy's been sabotaging her at every turn, and what's worse, Evelyn is Dorothy's late aunt, who's aware of the most of the shenanigans she's been pulling. But what's the most disconcerting to Carrie is she unexpectedly finds a cottage to live in that's almost a dream. It has a view of the river, once weekly housekeeping, a free handyman, and is within her budget. The owner of the mansion in front of it is the mysterious Dylan Avery, who's not around very often and no one seems to know anything about him. Nearly every character drinks. A lot. All the time. They drink when they get home from work; they drink with their meals; they have nightcaps. They have several drinks at restaurants. Some get ripping drunk...which probably wouldn't bother me so much except they have no trouble driving afterward. I'm a big believer that if you plan on driving you shouldn't have alcoholic beverages - not even one. It's dangerous, and puts others at risk just because you're behind the wheel. (However, I have noticed a trend that it's more prevalent where people drink and drive in books that take place on the East Coast, while not so much anywhere else. Curious, indeed). Well, enough of the PSA. She knows that the victim's son Jared thinks they're dating (and so does everyone else), but never seems to 'find the right time' to tell him they're not, thereby hurting him when he does find out. It seems callous on her part. She should have told him immediately that she only wanted to be friends, and not accepted so many family dinner invitations! It bothered me that it appeared for all intents that she was going to start a relationship with him, but the minute she met Dylan she made excuses - and there also were excuses "discovered" why she shouldn't. So, if another cute guy shows up when Dylan's out of town, will she dump him? Plus, it's pretty much a non-romance. At this point in her life you'd think she'd want a guy who would be around enough to actually do something with; not some 'mysterious' childhood playmate that she hadn't seen in years and rarely comes home. Who would want that? This library somehow has tons of funds to do all kinds of things our libraries don't do - and we have over 25 of them here! Cooking demonstrations? (And only charging $5 a person to boot). It didn't seem realistic at all. What library has the facilities or inclination for this? Where are they going to put the cooking station? You'd need proper ventilation or the entire library will smell like various cooking scents. Very odd indeed. There also weren't any descriptions of the town. She described her cottage, but that's about it. We learned what she ate and where she ate, but nothing else. What types of businesses are in town? How old is the town? What does the library look like? I also got tired of the fact that she was wearing tights and leggings everywhere, and dressing Goth at thirty but calling others juvenile and dim-witted. Really? Carrie also seemed a little spineless for my taste. She didn't want to tell Jared she didn't like him 'that way.' She didn't tell people 'no' that she wanted to; she didn't even go to her director when Dorothy was bothering her, thinking she could take care of it herself. Well, she couldn't, could she? She needed the help of resident ghost Evelyn to do that. She just didn't seem very mature for her age, but complained that Jared wasn't mature for his age. Double standard? Which brings to the fore that Evelyn wasn't in the book much at all. 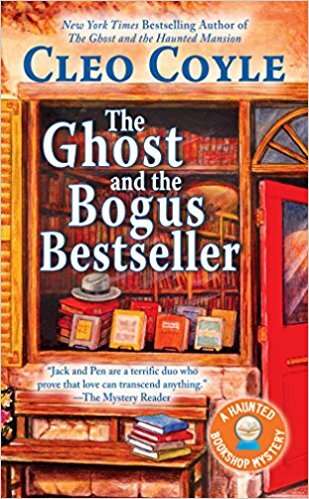 It's touted as A Haunted Library Mystery but the ghost is rarely in the book. She shows up to help Carrie a couple of times on library business, but doesn't help her when it's really needed to save time and effort. How strange is that? I would have liked to have seen more of her in the book. However, I did like the idea that Carrie actually wears makeup instead of putting on 'a little lip gloss' and thinking she's ready for the day. More women wear makeup than not, and it's finally nice to see an author who realizes this. It might seem minor to some, but every female I know wears makeup so I find it disheartening that in most cozies they seem to think the aforementioned lip gloss makes them "hot". 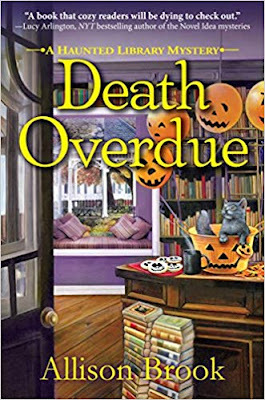 I did like the idea it takes place at Halloween and the library cat, although if she takes him home at night he's pretty much her cat that she brings to work; still, it's nice that he's been added, albeit lately, to the book. Which brings us to the fact that I knew who the killer was right away (it was pretty obvious from the get go) but it wasn't enough to keep me from reading the book. I like to see how the MC comes to their conclusions as they find clues along the way. Hopefully when the second in this series comes along the author will have honed the characters a bit more, given Carrie a backbone and have her less judgmental, give Evelyn a bigger part, and not make the killer so obvious. If these things are attended to, this series can go on for quite awhile indeed. As I said, I would have given it more stars but I really do not like the drinking and driving and hope that in future books someone will have sense enough to become a designated driver. After an elegant new customer has a breakdown in her shop, Penelope suspects there is something bogus behind the biggest bestseller of the year. 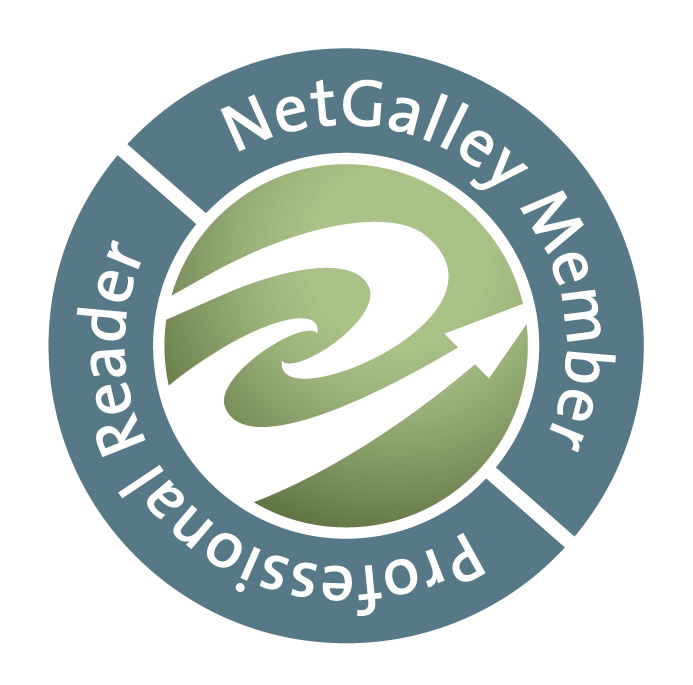 This popular potboiler is so hot that folks in her tiny Rhode Island town are dying to read it - literally. First one customer turns up dead, followed by another mysterious fatality connected to the book, which Pen discovers is more than just fiction. Now, with the help of her gumshoe ghost, Pen must solve the real-life cold case behind the bogus bestseller before the killer closes the book on her. Penelope Thornton-McClure is a widow with a young son who moved to Rhode Island after her husband's death. After renovating the bookstore that she now co-owns with her aunt Sadie, she discovered that she can communicate with the spirit of a dead private detective, Jack Shepard, who was murdered on the premises back in 1947. She's become used to having him around, which is a good thing since it's apparent there's no lack of crime in small-town Quindacott, and he guides her as she conducts her own investigation along the way. This time a distinguished older woman has entered her shop for a copy of the newest bestseller, Shades of Leather. But seeing the book has upset her as she exclaims that the young woman on the cover is herself. 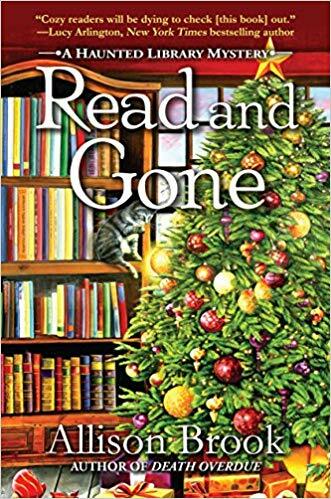 She runs out of the store, unpaid book in hand, and Penelope is so disturbed by her reaction that she vows to track her down (and, as Jack quite often points out, get the money for the book). Seeing that the woman left her gloves behind gives her a reason to do so, and as she discovers the information she needs, she goes to the woman's residence - a run-down sort of older Victorian home - and she enters but only finds a parrot. Exploring further she notes that the woman has a wonderful collection of first editions, and exploring further still, she discovers the woman's dead body below a balcony, apparently from a fall. It's been a few years since the last book in this series was published, and I, for one, am glad to see the resurrection has finally come about. The author has indeed given us a delightful book with Pen and Jack, and it is all that I've hoped for. The mystery is written extremely well, and the characters are like old friends returned to us after a long absence. I find Seymour rather endearing this time, even in his penchant for kitsch. He's a staunch friend and intelligent enough to figure things out on his own. This time out we also have a friend of Spencer's, Amy Ridgeway, a precocious twelve-year-old who manages to temporarily join the household and also endear herself to the family with a clear aptitude for learning about the bookstore and how it's managed. I can see her returning to future novels. There's also a bit of humor about something Jack's discovered that's a favorite of Spencer's and brings a bit of lightness to the story. The tale is woven tightly and there are plenty of twists and turns, with a lot of red herrings thrown in. While there are misconceptions throughout, this seems necessary for the story to succeed and only adds to the pleasure in reading. When the ending comes and the killer is revealed, everything falls into place nicely as it should giving us a final sense of satisfaction. It says a lot when you close a book and there is a smile on your face, as this one brought to me. Once again, I am glad to see this series brought to life and hope that it's a good, long one. Highly recommended. Julia Bonatti loves the freedom of working for herself as a professional astrologer. But after receiving several unexpected bills, she considers a temp job offer from her old boss a stroke of luck too good to pass up. On her first day, the posh law office becomes a crime scene when one of the partners is found dead. Julia discovers that a series of death threats have been sent to several employees of the firm, and she uses her astrological expertise to discover possible motives. But before she can convince the authorities of what she knows, the killer strikes again. Will Julia unmask the culprit before he, or she, takes another life? Julia Bonatti is a professional astrologer in San Francisco. She's recently acquired a string of bills that will take more than what she makes to pay off, so she reluctantly accepts a temporary position with the legal firm she once worked for. On the morning of her first day she hears a woman scream and it's discovered that one of the partners, Jack Harding, is dead, found in his office by one of the staff. After everyone has been questioned and released to go home, the head partner, David Meyers - who is also the person Julia will be working for - takes her to lunch and tells her he had an ulterior motive in asking her to fill in for his vacationing secretary. It seems some of the employees have receiving threatening letters and he wants her to quietly see if she can find out who sent them. While Julia is stunned, she agrees to do what she can. To add to the situation her late fiance's sister Maggie arrives with some unsettling news: it seems that the day Michael was killed in a hit-and-run in front of their apartment the man across the street was taking random pictures and caught part of the accident on film. Not much, but enough to where a retired police detective is willing to see what he can find out. Then her friend Gale is expecting her to attend an art opening, and it's hinted by another friend, Cheryl, that Gale has her eye on the artist. While Julia is there she sees one of the law firm's attorneys, Nora Layton, speaking with the artist outside, and it doesn't look friendly. I have read all three books in this series and I have to say that this one is my favorite. There's plenty of action regarding the main plot, and while I feel that the secondary stories - that of Gale and Julia trying to find out who killed Michael - don't have the "legs" as it were to be very interesting, there was enough going on that it didn't really matter. I personally feel that this may be, after all, only because they were relegated as a minor part of the story and didn't have a lot to do with the main plot. Not a big deal, just an opinion. While we watch Julia struggle with her feelings about Michael and how she's going to be able to move on, we see her new struggle with opening herself up to allowing someone into her life again. The story has a double message if you look for it; sometimes remaining in the past won't allow you to be part of the future. There were plenty of twists and turns and a couple of surprises along the way, and even though I figured out the murderer early on, clues are strewn throughout the tale if you look for them; and it was still enjoyable to watch Julia figure it out. I have to say that the ending was suspenseful enough on its own to make the book worth reading, which is a good thing, and even though the urge may strike some readers, please don't peek ahead. Some surprises are better left for last. Highly recommended. Julia Bonatti is an astrologer who's been roped into being part of a wedding party of her friend Geneva, one she really doesn't want to be part of but is doing so out of loyalty. While there she sees that the bride's sister Moira not only doesn't show up to be in the wedding, but when they do find her she appears to be drunk, even though she insists she's not. Later that night members of the wedding party retreat to the bride's sister Brooke's home to spend the night, lugging the wedding gifts with them. During the night Julia hears what appears to be gunshots and finds out that Brooke's husband Rob has shot an intruder in the garage. When the lights come on, the intruder is discovered to be Moira, and she's declared dead at the hospital. When Rob insists there was another person in the garage and he didn't kill Moira, Geneva asks Julia to investigate and find out if there was another shooter, and if Moira was involved in something shady. So Julia reluctantly agrees and goes to Moira's apartment, only to be conked on the head while there and knocked out. When she comes to, she barely makes it out of the apartment before the police arrive. What she does find, however, is an expensive bracelet - one that Moira could not have afforded, given her spotty employment record. But when she shows the bracelet to Geneva, she knows nothing about it. This is the second book in the series, and I really wanted to like it as much as the first; however, I felt the story got bogged down by endless details about everything - where she parked, the attitude of valets, etc. ; just descriptions of everything Julia encountered. I mean, honestly, how many people do you know describe every single moment of their day? And would you want to spend time with them if they did? Julia is investigating the murder by herself with no help from anyone in the victim's family, which I find extremely odd considering she didn't even know Moira that well, if at all. I certainly wouldn't put myself out to investigate the murder of someone I barely knew. It doesn't make any sense, even given the fact that Geneva stood by her after Michael's death. No explanation is given as to why Geneva isn't 'along for the ride' as it were, at least on some level. Instead, she just put the entire thing in Julia's lap. And when Julia is knocked out, Geneva doesn't even show real concern - she doesn't tell her to stop the investigation right there because her life might be in danger. She just allows her to continue on. I also didn't care much for Brooke. She decided that she'd rather divorce her husband instead of having a second child, and when I read that she thought her career was more important than the marriage, well, that's telling right there. Yes, I know the outcome and everything, but if either man or woman puts career ahead of marriage it pretty much says it all, doesn't it? Didn't they discuss this before marrying? I also felt the secondary story of Celia seemed more like filler so that the reader didn't forget the reason why Julia decided not to date again. All it did was tell me that Julia is a doormat. She investigates a murder - putting herself in danger - without help from the victim's family and doesn't say anything. She allows her almost-mother-in-law to say things to her and push her around without fighting back. She also goes to a building to eavesdrop on a conversation and gets into a cabinet to hide and gets locked in the building, then has to figure a way out without getting caught when she gets locked in. It seemed like a really stupid thing to do. Now I know these were plot lines with a reason behind them, but I think they could have been handled differently to show us that Julia was not blatantly stupid. She professes to live her life by Astrology, but never sees if danger awaits her if she does certain things? Why is she never looking at her own chart and taking precautions? While these things may have detracted from the book for me, it was the ending that saved it, and the reason I give it three stars instead of two. It was a nice one indeed, with a little bit of action and ingenuity and definite pluck on Julia's part that made me realize there is a brain in her head after all. While I figured out the killer early on, it was interesting to watch Julia get to the gist of the matter and figure it out for herself. This book is an easy read for a quiet afternoon and I will read the next in the series, because I did enjoy the first book. This was the only rule bookshop owner and widow Penelope Thornton-McClure had given her resident ghost, hard-boiled PI Jack Shepard. But when the hot young author Angel Stark arrives at the store to promote her latest, a true crime novel, Jack can hardly contain himself. After all, this is his specialty! Angel's book is an unsolved mystery about a debutante found strangled to death. And it's filled with juicy details that point a finger at a number of people in the deb's high society circle. But when the author winds up dead too - in precisely the same way - Pen is fast on the case...which means Jack is too. After all, a ghost detective never rests in peace. When a young author named Angel Stark arrives at Pen's bookstore for a promotion on her new book, Pen doesn't expect things to get heated. But she should have, considering the book is about a dead debutante named Bethany Banks whose murder is still unsolved. When Angel is attacked outside the store and local boy Johnny Napp arrives to help, Pen doesn't realize that when Johnny leaves with Angel it will unleash a slew of events that will bring Bethany's last night on earth back to the forefront; and that there's more story yet to be told, and Johnny might not only be who he says he is, but have a decidedly bigger role in it. When Angel's book comes out there's obviously people who don't like it; namely, those that are participants in the story. All of them are from wealthy backgrounds and thus far have been able to protect themselves from the notoriety of murder. Yet the book promises to lay bare the details of the gruesome night Bethany was found strangled, and someone is obviously guilty. But when Angel herself first has run-ins with several people - the dead girl's sister, for one - and then is later found murdered in a similar manner, it's obvious someone wanted to make sure this was her first and last book. But since Johnny is the main suspect, Pen feels that she needs to find the truth, because he's been dating her clerk Mina she thinks someone has it all wrong. So she enlists Jack to help her seek the real killer since it seems the police are focusing only on one person. This is the second book in the Haunted Bookshop series, and I can honestly say that I loved it just as much as the first. Penelope is beginning to accept Jack's presence in her life, and even depend on him when the need arises. She's also becoming a stronger, more resilient person, and I really like that. I also love the dream sequences where Penelope is able to travel backward in time to Jack's world; it's always for a purpose - to help her figure out things in her own world. I'm not going to lie; I really love that period of time, being a huge classic film buff myself, and any time I find a book that can pull me into it, I'm loving every second of it. This series is able to do just that, and I relish it. When the ending comes and the murderer is revealed, it's more a sense of justice that is felt than any evildoing on the part of the murderer, and that's fine by me. The writing is taut, the words flow, the story is well-told and I marvel at the fact that the author(s) can take us to the past so easily and make it believable. My only hope would be that when this series does make its final episode that somehow, those 'higher ups' as it were, would find that Jack is worthy of being given a second chance in life. After all, miracles happen every day if you just look around, and this would be no different. Recommended. 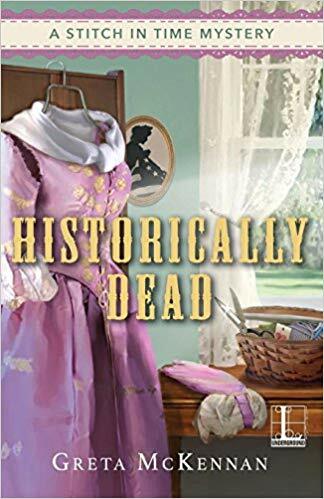 Young widow Penelope Thornton-McClure and her old Aunt Sadie are making ends meet by managing a mystery book shop - a quaint Rhode Island landmark rumored to be haunted. Pen may not believe in ghosts, but she does believe in good publicity - like nabbing Timothy Brennan for a book signing. But soon after the bestselling writer reveals a secret about the store's link to a 1940s murder, he keels over dead - and right in the middle of the store's new Community Events space. 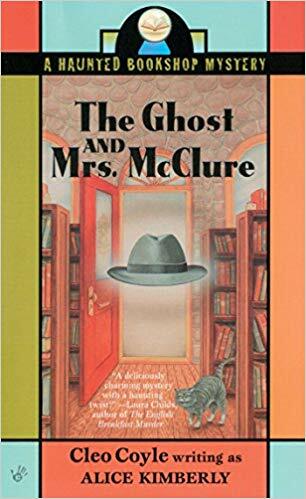 When Penelope Thornton-McClure makes a decision to take her husband's life insurance policy and use it to save her aunt Sadie's failing bookstore in the small town of Quindicott, Rhode Island, she renovated it and even changed the name to Buy the Book, which was suggested by her seven-year-old son Spencer. She decided that they needed to get out of New York and her late husband's wealthy parents' sphere, as they expected to run her son's life much the same way they managed their own son. So this is where she wound up, and she hoped she could make a living. What she didn't expect was that a famous mystery writer - Timothy Brennan - would decide to use the store to do a kick-off of his new book tour. When he arrived, along with his daughter Deirdre and son-in-law Kenneth and Shelby Cabot from his publishing house - not to mention a few others and a camera crew to film it - Penelope didn't realize her life was about to become upended. It wasn't bad enough that Shelby was taking control of her store, moving things around and treating her like she hadn't a brain in her head, but Penelope was one who didn't like to rock the boat, so even though Shelby hadn't returned any of her numerous calls to see if there was anything Timothy needed, she allowed any remarks to pass. It wasn't bad enough that Timothy treated her like a servant and yelled at her when she offered him something to eat. But then it started to get very bad all at once. Timothy began his speech and said that he wasn't going to write his best-selling mysteries about Jack Shield anymore, the ones he based on the life of real-life PI Jack Shepard, which drew disappointed murmurs from the crowded room. He said he was going to write non-fiction, starting with the murder of his friend Jack who was murdered in the 1940's, right here in Quindicott. In fact, he added, it was right here...in this space, where this bookshop now was. Penelope was as stunned as the rest of the audience, but more so by the heckler who was saying that he wasn't a friend of Shepard's, and if he had Shepard's case files, he must have stolen them. But as she looked around, she saw no one. Yet the voice continued, and Penelope thought she must be hearing things since nobody else seemed to notice. But things went from bad to worse when Brennan would very soon wind up dead on the floor of her bookshop, and Penelope was beginning to realize that he was right...Jack Shepard did die in the bookshop many years ago...and he was right here now, and she was the only person who could see or hear him. While I know that this is an older book, I also know that the series has been revived, with a new book due out soon. My only disappointment is that I didn't find this series years ago; alas, too many other books seemed to have gotten in the way. I'm not saying that there weren't any disappointments in the book, but anything I might have found can be easily shunted aside for this very entertaining book. I loved the idea that Jack is an honest-to-good 1940's private investigator. He dresses like one and talks like one. As a classic film buff, especially Noir, this couldn't be any better for me. I'm a sucker for this kind of stuff; and honestly, Jack's the best part of the book, period. Which isn't to say I don't like the other characters. Sadie isn't in the book very much at all; yet I get the feeling from something she said to Penelope that she's quite aware Jack is around the building somewhere, however she doesn't push the issue. I do feel that Penelope's young son Spencer isn't acting like a seven-year-old; he talks more like someone that's maybe twelve. I get the fact he's been to private schools, but still, there are times his vocabulary seems suited to someone older. I also didn't like "Pinkie" at all; I absolutely detest women who think they can steamroll anyone in their path and essentially blackmail them into doing whatever they want. Luckily, she wasn't in the book for more than a paragraph, and I hope it stays that way for future books. People like that can spoil an entire book. But then on to Penelope...she starts out as being wishy-washy, which I dislike in women. I wasn't sure what to make of it, but then her past came to light slowly, and I could tell that she had been gradually beaten down over time by a weak husband and his overbearing family; and even by the publisher she had worked for. Penelope just didn't know how to stand up for herself. But she would learn...with the help of Jack, even if she didn't want it. We watch Pen grow from a weak-kneed widow to a woman who has possibilities and strength, more of which I hope to see in the next in this series. I liked the interaction between Pen and Jack, especially the dream sequence where she's recounting a conversation to him, and appears to be one of his clients. I hope to see more of these 'dream sequences' in later books. The writing was very good and I enjoyed the story line immensely; as I stated above, I liked to watch Penelope's character grow as things continue. I'd also like to see Jack materialize a bit more, but again, since these books have already been written, it's only a matter of reading them that will tell me if this will happen. When the killer is finally revealed, it all comes together nicely, and I liked the way it was all put together. And while I know that it's too early to tell, I for one am glad that this has been revived and I hope to see the series go on for a good long while.